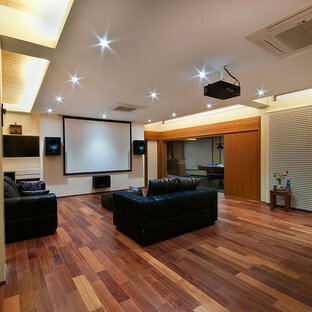 Home theater rooms are gaining popularity in India. 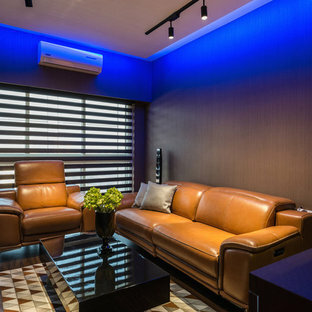 With the best home theater systems like 3D TVs, projectors and surround sound, you can easily bring Bollywood into your home. Movie buffs might even install a popcorn machine! 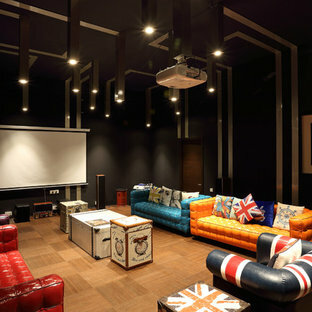 Other ideas include adding a gaming console that can hook up to the big screen to create a fully functional media room. 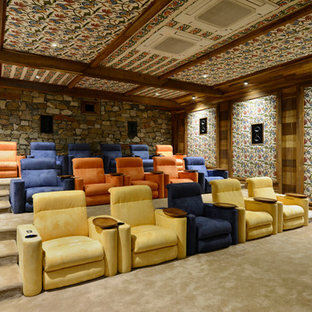 Browse through these home theaters before you start thinking of your own. Do I need a designated room for a home theater? 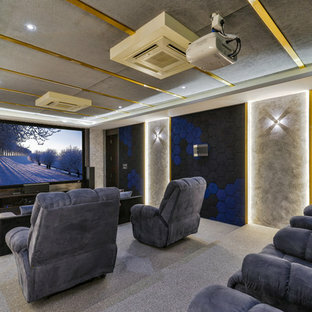 A dedicated home theater system and room is a luxury, but it’s not a necessity to enjoy the comforts of the movies at home. Most people integrate the home theater system into their living rooms. While this doesn’t allow you to play with decor and seating, it does let you create a general cinematic feel. 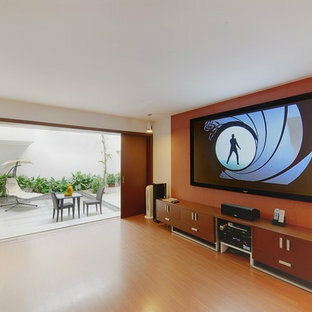 Remember, sound is the most important element for transforming a living room into a home theater. Start by investing in a quality surround sound system. Opt for wireless or ceiling integrated speakers to avoid tripping over cables in the dark. 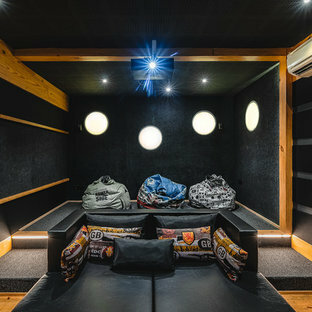 If you have a standalone theater room design consider making your speakers a feature and think about the right flooring, door and window protection to amplify the sound. What equipment should I add to my home theater? 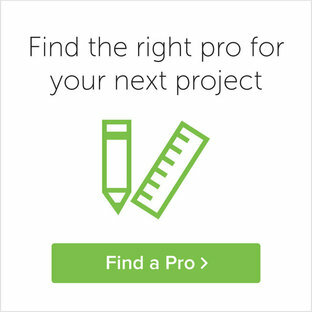 Budget and personal preferences will dictate your TV room equipment. Most home theater systems will include a projector and screen, or you can use a high-definition television to screen your shows.Opt for oversized wall-mounted TVs that match the size of a projector screen to ensure better image quality. When it comes to high-quality audio, surround sound is the way to go. Install speakers throughout the space, and be sure to put in soundproof wall panels so you don't disturb family members or even neighbours. What kind of seating and home theater decor should I use? The kind of seating depends on the room and your overall budget. If you are willing to splurge invest in some real cinema chairs or stadium seating. These often include features such as snack and cup holders and reclining ability. Platforms and stairs, complete with LED step lighting, can mimic tiers for a more cinematic effect. 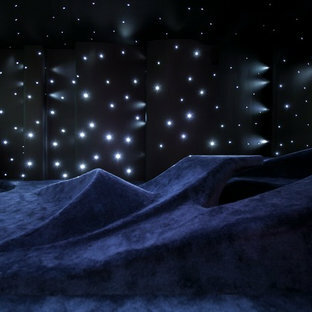 Considering your home theater room is going to be dark most of the time, you can keep the decor minimal. Opt for velvet, black-out curtains to create the theater look, as well as block out any light. You can also put up a couple of posters from your top movies and highlight them in simple frames. A mini fridge or bar is also a perfect add-on for mid-movie snacks and drinks.